A woman in Haiti speaks out against gender based violence with the help of our staff. Edline was introduced to Samaritan’s Purse through her church, Actes des Apotres, which is part of the a project called Restoration of Hope and Dignity for Women. The objective of the project is to teach churches to understand and articulate the issue of gender-based violence in Haiti, and to prevent and reduce its social tolerance through the teaching of biblical truth. At the initial training session, 33 church leaders received information about gender-based violence, including different examples, what immediate services survivors require, and examinations of how gender disparities often perpetuate the problem. The training also enabled participants to explore biblical truth and re-examine existing myths that leave women and girls vulnerable. Edline is a married, 42-year-old mother of two teenagers. She runs a small business selling food and various household goods from her home and is the director of the choir at her church. She is like many women living in Haiti who work hard every day to help feed their families and pay their children’s school fees. 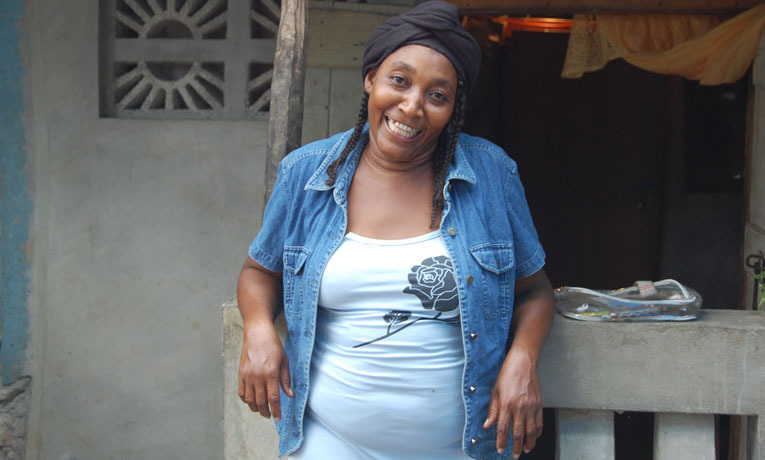 And, like many women in Haiti, Edline is a victim of gender-based violence. During the meeting that followed the initial training, Edline stood up before a room of other church leaders and shared that she was sexually assaulted by a trusted family friend when she was 15. Despite this being a very traumatizing experience, she had never heard it spoken of in her church and remained silent for 27 years. After attending the training, Edline said she felt compelled to fight for women and girls that are suffering in silence by sharing the testimony of her own experience. “Even when I was baptized and became a Christian I didn’t hear it talked about in my church, so I never realized that when these things happened they shouldn’t remain a secret,” she said. Edline now speaks out about her experience in an effort to show other victims they are not alone. She has shared her testimony at other Samaritan’s Purse gender-based violence training seminars and has challenged women and girls to speak out about their experiences in order to break the silence. She also made the courageous decision to allow her story to be used for Samaritan’s Purse radio programming activities. Edline’s testimony was recorded and broadcast on four popular stations. After each broadcast, a Haitian church leader and a gender-based violence expert demonstrated how the culture of silence perpetuates the suffering of victims, and discussed how the local church can reach out to vulnerable women and girls. Edline’s testimony was so powerful that a well-known grassroots women’s organization asked permission to use it at their trainings and outreaches. Edline continues to participate in Samaritan’s Purse’s gender-based violence workshops with the goal of using her new knowledge and personal experience to raise awareness in her congregation and community, and to ultimately bring healing through Christ.